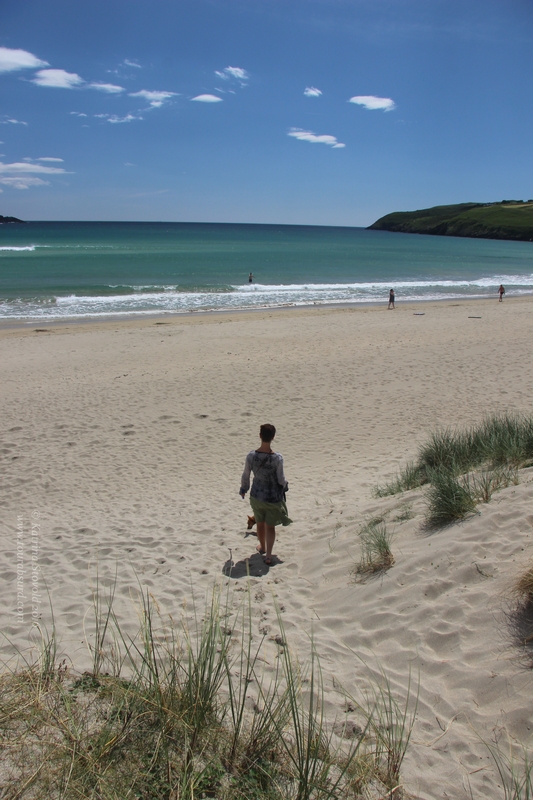 Every once in a while, Ireland has a summer. You’d think it would be a rather regular occurrence, but I assure you it is not. 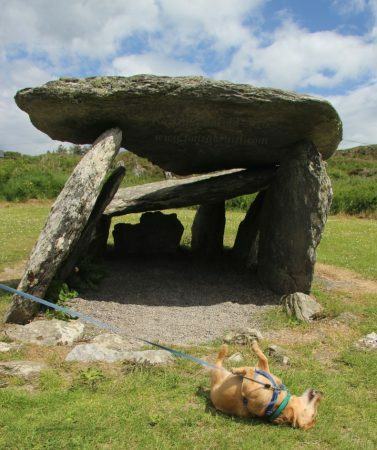 Oh, the Earth’s axial tilt and rotation around the sun may theoretically put the Emerald Isle within a zone meteorologists (twisted people, those) refer to as “summer”, but that does not mean it automatically translates into sunshine and barbecues. When my friend, Elisabeth, wrapped up her year of travel and language study, I convinced her to pop over to Ireland before settling into the life of a hausfrau back in Germany (ha!). I mean, really, after spending a year travelling the world, what would you do? Why, travel some more, of course! 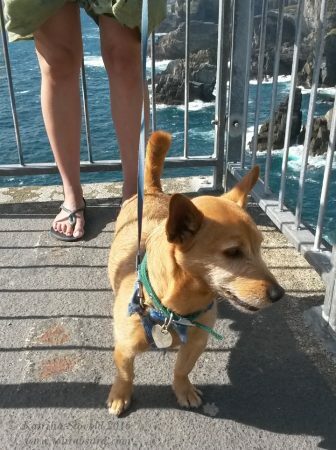 Public transport being rather abysmal in Ireland, not to mention dog-unfriendly, she hired a car. 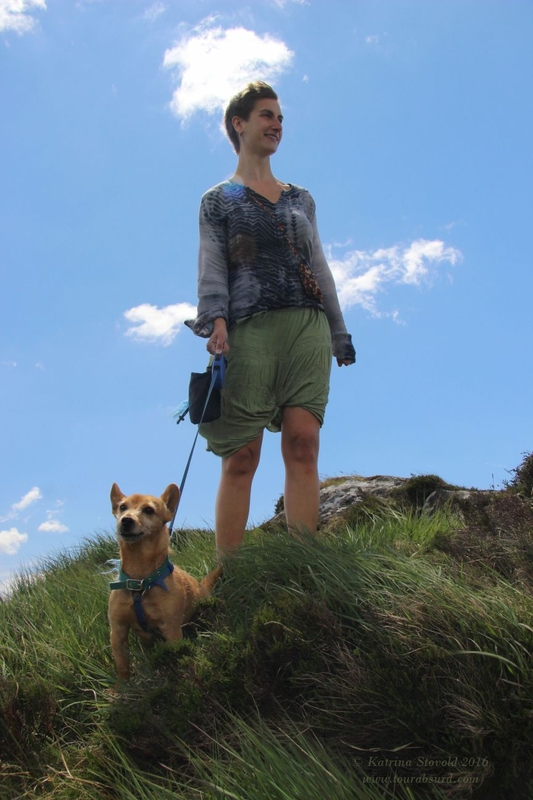 She was thus able to visit friends outside of Cork city centre with minimal fuss and on a moment’s notice, as well as drag yours truly and Gobi the Terrier along for some fresh air and sightseeing. As is our wont, we loosely discussed possible destinations the previous day, only deciding our actual direction once we were all packed in the car. (She is far too spontaneous to be a proper German, I tell you.) A beach fitting our dog requirements – medium to large size, far from the road, hopefully sheep-free – was discovered near a tourist destination I had, thus far, been unsuccessful in visiting: Mizen Head Signal Station & Visitor Centre. It’s not that I hadn’t been to the general locale before, only that I always managed to show up when everything was closed. We vowed that, by the gods, Today Would Be Different! And it was. Getting there, however, was more than half the fun. As we drew near, Elisabeth spotted a mountain she’d been up before and decided she wanted to go again. I say “mountain”, but smirk a little when I do. Of course, it’s all relative, isn’t it? For Ireland, 407 metres (1335 feet) is definitely a mountain! The last time my compatriot had been there, the weather had not been nearly as spectacular as it was that day. Mount Gabriel (Irish: Cnoc Osta), as we later learned it was called, has a teeny tiny, winding, single lane road up to the top. There are, of course, sheep. The Irish Aviation Authority (Údarás Eitlíochta na hÉireann) has a couple of golf ball shaped domes up at the top, presumably to entice passing pilots to stop and join a game. We had spectacular views from both sides. Elisabeth and Gobi struck a pose out of a painting (or a very awkward taxidermy display), as if they were conquering invaders, descending upon the land. 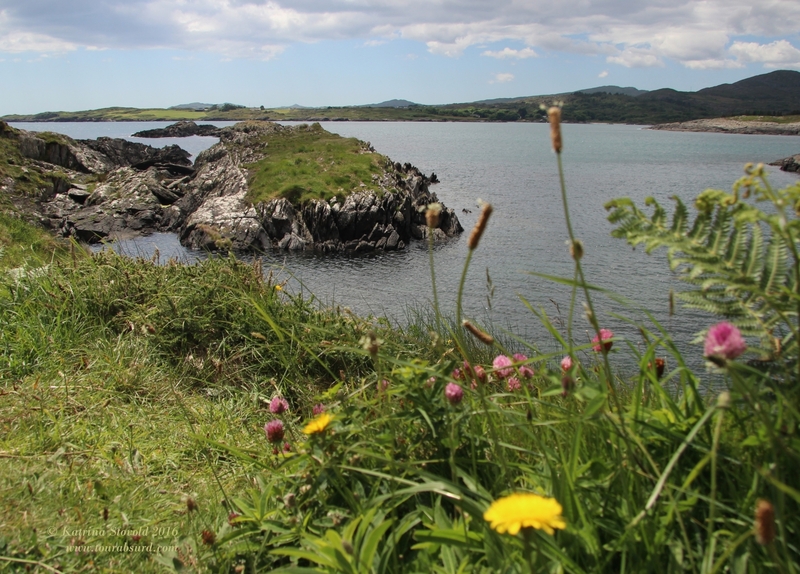 We spied lakes, bays, islands, and castles, not to mention sheep, from our vantage point. It was blustery and cold, but would have been a great setting for a music video, no fans needed. My only other experience in dealing with Mr. 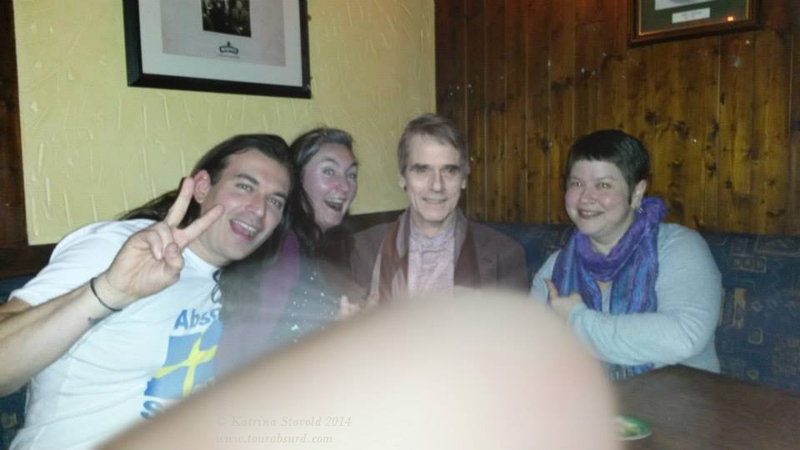 Irons had been to create a badly photoshopped picture of him sitting with myself and some classmates at a local pub. We convinced absent classmates that he had joined us by posting about how he’d sat with us, thrown back a few pints, and invited us to his castle. The “proof” came later, complete with fake thumb-over-the-lens effect. Oh, also, we managed to hand him a print of the picture when he came to present a film at the university. We are geniuses. After completing our mountain conquering, we continued on to the beach. However, we were distracted yet again! We stopped at the Altar Wedge Tomb (Tuama Dingeach na hAltóra). The car lot always sneaks up on you when you’re headed west on R592, but somehow we’ve been lucky enough to spot it every time. Ancient peoples were apparently also great appreciators of a good view, as it sits in a lovely spot overlooking the water. Besides being a humbling bit of history – it’s said to be around 4,500 years old – it is theorised to be aligned with sunset on Samhain (“SOW-en”), known these days as Halloween. 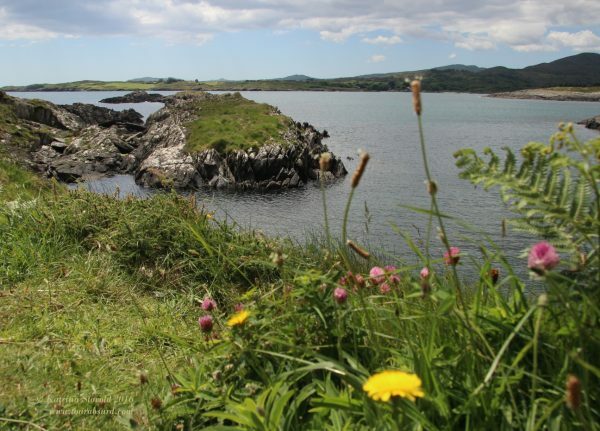 It is also aligned with the nearby Mizen Peak. None of this matters to Gobi. He has no respect. Back in the car with you, dog! We finally made it to Barleycove Beach. And, oh, gentle reader! It was beauteous. The sun, the sand, the colours of the water! But let me back up. In order to get to the beach itself, you must follow a boardwalk through low dunes and cross a floating bridge – yes a floating bridge! 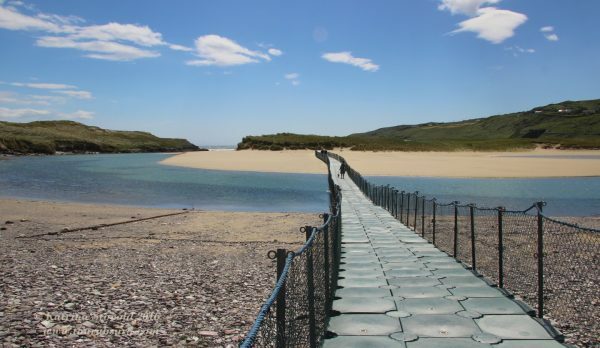 – then cross some more dunes until the beach is revealed to you. Gosh, you can just about hear the heavenly chorus as you come over that last bluff. If you didn’t know better, you might think you were on the Mediterranean. Ceru-wooo!-lean! 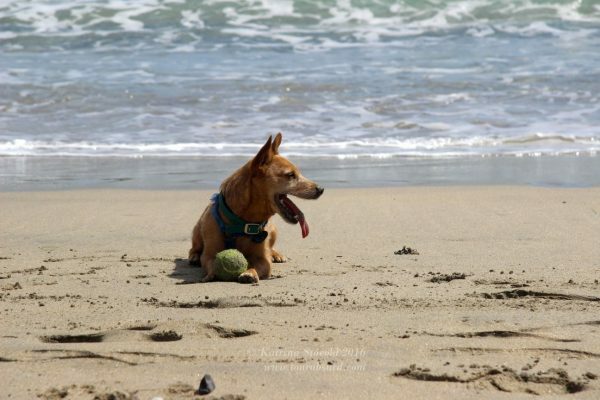 Gobi chased the ball, rolled in the sand, and even made a friend. Elisabeth and I threw the ball, sat on the sand, and dared each other to go in the water. For all that it looked tropical, it felt arctic. We were quite amazed to see a woman cavorting about in the waves for well over half an hour. Clearly, we decided, she must be from Norway. Either that or she was part seal. These were the only two possible explanations. 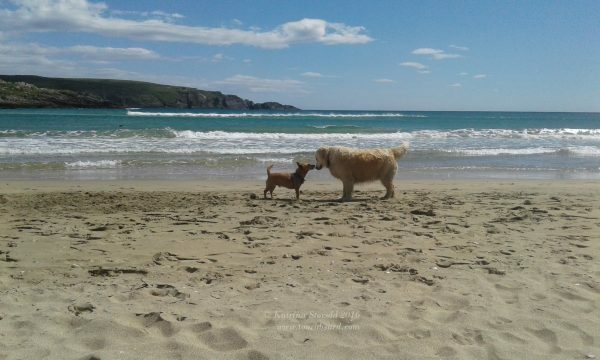 After soaking up the sun, attempting to disabuse Gobi of the notion that the ball launcher was a tug-o-war device, and revelling in our luck with the weather, we headed back to the car. On our return trip across the floating bridge, we encountered two delightful phenomena. One was the Norwegian seal woman who, it turns out, is actually German. (She swims there every day, she said, and gradually got more and more used to the temperature.) The other was several giant fish swimming underneath the bridge. They were around 45 to 60 cm (1-1/2 to 2 feet) long and there were loads of them! I am not sure why it was so delightful, but it really was. If my hands had not been full of beach supplies, I would have clapped them in glee. What a lovely finale to our visit to Barleycove. The website rather effusively encourages you to visit because, well. I’m not sure. Because your life will be forever changed! Maybe. Wow. That’s pretty impressive, that statement. I mean, I suppose I did feel my life had been affirmed by finally making it there during business hours and getting to stand on Ireland’s most southwesterly point. Who doesn’t want that? I hope I will carry forth this newly found serenity into my daily life. What I will definitely carry are photos and memories. We really did strike gold with the weather. The views were amazing. Sadly, we did not spot any whales, dolphins, or seals, but the wind and the sound of the waves were brisk and refreshing. This was a good thing because there are many, many stairs to climb to get to the farthest viewpoint. It’s possible to get to most spots and displays by wheelchair-accessible ramps and pathways, but not quite to the tippy top. Unlike buses in Ireland, however, they do allow dogs. Huzzah! Besides the views, there are several buildings that have been re-purposed to hold exhibits about lighthouses, shipwrecks, engineering, wildlife, and the life of lighthouse keepers. Some of it is quite low tech, but absolutely adorable. My favourite was a small, dark room containing the prow of a ship upon which visitors stand. There may have been wave sounds. A small yellow light could be seen at what appears to be a great distance. Ah! It’s the Fastnet Lighthouse! You could really get a sense of what sailing at night around the coast of Ireland was like back in the day. Well, minus the cold and wet. And the seasickness. Don’t forget the seasickness! 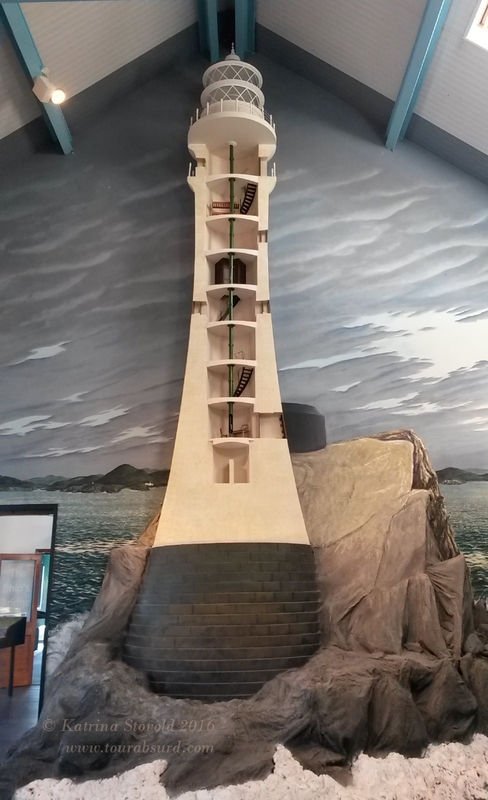 The visitor centre has some nice displays about Fastnet Rock and the inside of the lighthouse. There’s also a very cute gift shop and a cafe. After succeeding in climbing up and down all the steps and managing not to get carried off by the wind, we had a snack and exhaustedly made our way home. All in all, a most satisfactory day! Who knows? What with my earlier visit to Fota House, this could actually shape up to be a decent summer. Knock wood!